MASON, Ohio -- Maria Sharapova fell short of what would have been yet another gritty comeback win, losing to Ana Ivanovic 6-2, 5-7, 7-5 in the Western & Open semifinals on Saturday night. Ivanovic looked on her way to a straight set rout, leading 6-2, 5-2 before nerves seemed to get to her and Sharapova stepped up to win five straight games to even the match at a set apiece. Then, came the drama. With Sharapova serving at 0-1 in the final set, Ivanovic pulled up after a point at 15-all and called for a medical timeout due to nausea. 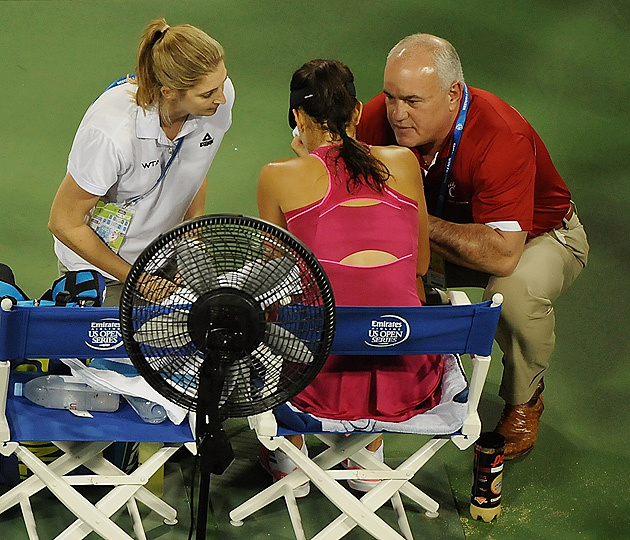 "I was really feeling nauseous," Ivanovic said. "I think I ate something bad today. When my coach was coming out, I kept telling him I don't feel good, like my stomach is really upset. Then, it really build up in the third set, and I was not feeling fine." ​Ivanovic, after being evaluated by the physio and doctor, was asked to lie down on the court to get her blood pressure taken and to receive pills. When the match resumed, Sharapova held her serve to 1-all and then broke for a 2-1 advantage. The two exchanged breaks one more time and Sharapova served to consolidate her break lead at 4-3 when Ivanovic broke her again to level the set at 4-all. That game ended with a double-fault off Sharapova's racket, and she appeared to turn to the umpire, tap her upper arm with her racket and say "Check her blood pressure," toward the chair umpire. "I never actually got a clear answer on what it was, but, I mean, I don't know," Sharapova said after the match. "Could have been something like an anxiety [attack] or something. I'm not really sure what you take blood pressure for. We played a pretty long point afterwards and she seemed to be doing well. Not really sure what was going on there." The timing was a bit strange, but she looked okay." Despite it all, Sharapova would earn her third break of the set and served for the match at 5-4. She had two match points but couldn't convert, with Ivanovic firing an inside-out forehand winner to save the first and then Sharapova missing a backhand on the second. Ivanovic broke to level the match at 5-all, and then broke Sharapova two games later to seal the win after 2 hours and 46 minutes. Ivanovic advances to her fifth and biggest final of the season. She'll have a short turnaround, where she'll play No. 1 Serena Williams on Sunday at 2 p.m. ET. It will be the fourth meeting between the two this year, with Ivanovic beating Williams at the Australian Open in January and Williams winning their last two. All three matches have gone three sets.